I’ve been working as an English teacher in France for the last year and have just moved back to the UK. The shifts in France were tedious, planning for lessons took up most of my time and even my weekends were full of work and preparation. To get me through this, I told myself I was allowed to spend a portion of my wage on treats, one of which was allowed to be something I normally wouldn’t be able to afford. I’ve started working back at debenhams since moving back here and I’ve grown really attached to Thursday treat day, as I called it, so I’m going to continue that here and blog about it every fortnight! This time, I’ve mostly bought things from the May wishlist I posted last week but there are a few other little goodies that I treated myself to that I haven’t mentioned yet. I posted a tweet a few days ago asking people for LUSH recommendations. Over the years I’ve received a few LUSH gift boxes from family members, with preselected products, but I’ve never actually gone into LUSH and chosen any myself. A few lovely fellow bloggers recommended the Comforter Bubble Bar and I only had to smell it to fall in love with it. It smells like my childhood, but the closest thing I can think of that the smell reminds me of are those blackcurrant fizzy sweets. The bar lasts for around 4 or 5 baths, depending on how many bubbles you want, so it’s pretty good value for money as well. I love the smell and quite frankly anything that turns my bath water baby pink is fine by me. 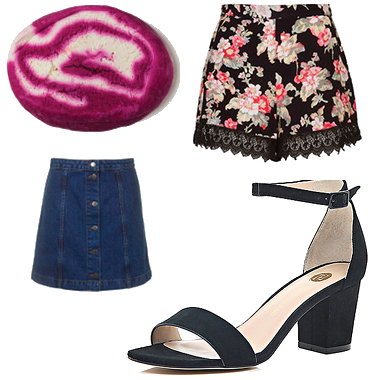 I nipped into Topshop at the weekend and I ended up buying the skirt that I’d included on my May Wishlist, but I also found an absolutely gorgeous pair of floral shorts in the last chance to buy section. I did actually buy the matching top but thought it was a little bit too much pairing them together, so I’ve returned that, but the shorts are so lovely. I wore them out on a night out over the bank holiday weekend and they got some lovely comments from my friends. They’re also perfect for summer and my travels, so I’m really happy with this purchase. I also mentioned in my May Wishlist that I’m not a heel-wearing kind of girl, normally. I decided against the ones I loved from Public Desire, just because I wasn’t sure what size I am there, and I needed them for the weekend so it would have been a bit of a rush. I went into River Island with a guy pal, looking for shirts for him, and came out with these beautiful little heels. The height is perfect for me because I am quite tall anyway, but they do add that little bit extra and elongate my pegs. They were a tad expensive but I know I’ll get plenty of wear out of them so I’ve justified it to myself. Next Post List: What I’m …ing at the moment!